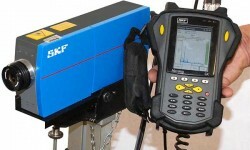 The SKF Laser Vibrometer MSL-7000 is a digital integrated single-box vibrometer that has been developed specifically for non-contact vibration measurements. Together with the German company Polytec GmbH, SKF customized the Laser Vibrometer as a way to apply a new technology for noise-testing applications in bearing manufacturing and at the same time extend the assortment of ­sensors for use in condition monitoring (fig. 1). Additionally, SKF can offer end-of-line quality control systems to its customers. 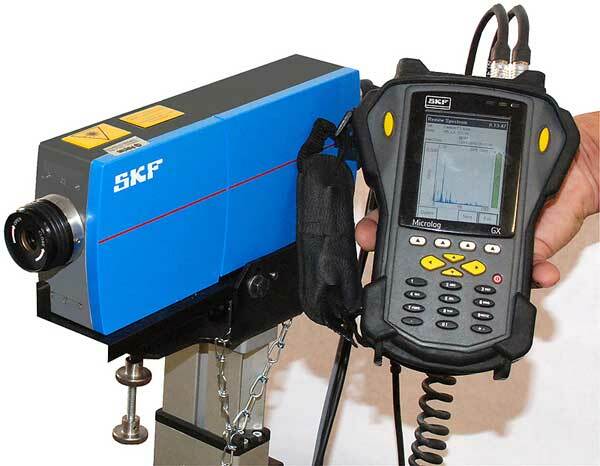 The introduction of a contactless method of measuring vibration in the form of the SKF Laser Vibrometer MSL-7000 has significant implications for both condition monitoring and production quality testing. Developed in cooperation with Polytec GmbH in Germany, this small, compact and easy-to-install unit extends the assortment of sensors for use in condition monitoring. It has already been employed by SKF for noise-testing applications in its own bearing manufacturing. 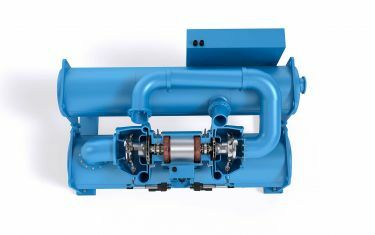 The SKF Laser Vibrometer can be connected with SKF noise-testing technology for advanced end-of-line testing installations for other types of equipment, such as electric motors, pumps and compressors, thus opening the technology to other companies. The MSL-7000 features a robust, compact design in a single unit that is easy both to install and to operate. It employs non-contact measurement and thus is reliable and free from wear. 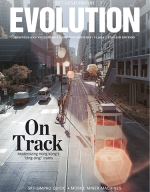 The design is easy to integrate into test set-ups and existing control systems. The MSL-7000 covers acoustic measurements from 0.2 Hz (for slow rotations) up to 22 kHz. From a safety perspective the product incorporates an eye-safe, visible, low-power laser (Class II). 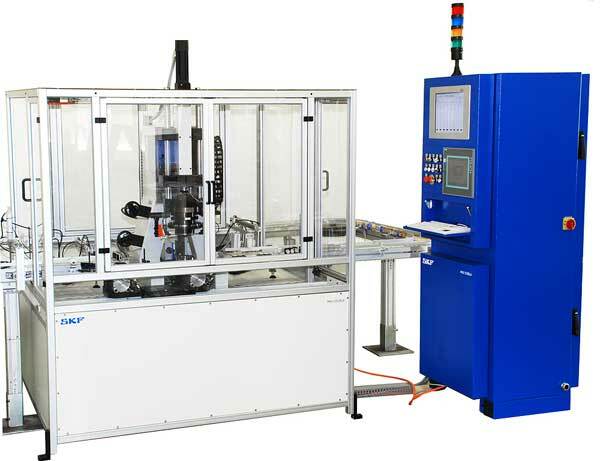 At the heart of each SKF Laser Vibrometer system is a laser-­Doppler vibrometer (LDV) – a precision optical transducer used for determining vibration velocity and displacement at a fixed point. The technology is based on the Doppler effect: sensing the frequency shift of backscattered light from a moving surface. where v is the object’s velocity and λ is the wavelength of the emitted wave. To determine the velocity of an object, the (Doppler) frequency shift has to be measured at a known wavelength. This is done in the LDV by a laser interferometer. This interference term relates to the difference in path length between both beams. If this difference is an integer multiple of the laser wavelength, the overall intensity is four times that of a single intensity. Correspondingly, the overall intensity is zero if the two beams have a path length difference of half of one wavelength. Fig. 2 shows how this physical law is exploited technically in the LDV. 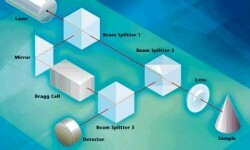 The beam of a helium neon laser is split by a beam splitter (BS 1) into a reference beam and a measurement beam. After passing through a second beam splitter (BS 2), the measurement beam is focused onto the object under investigation, which reflects it. This reflected beam is now deflected downwards by BS 2, merged with the reference beam by the third beam splitter (BS 3) and then directed onto the detector. As the path length of the reference beam is constant over time (with the exception of negligible thermal effects on the interfero­meter) (r2 = constant), a movement of the object under investigation (r1 = r(t)) generates a dark and bright (fringe) pattern typical of interferometry on the detector. One complete dark-bright cycle on the detector corresponds to an object displacement of exactly half of the wavelength of the light used. In the case of the helium neon laser, used almost exclusively for vibrometers, this corresponds to a displacement of 316 nm. Changing the optical path length per unit of time manifests itself as the Doppler frequency shift of the measurement beam. This means that the modulation frequency of the interferometer pattern determined is directly proportional to the velocity of the object. As object movement away from the interferometer generates the same interference pattern (and frequency shift) as object movement towards the interferometer, this set-up cannot determine the direction in which the object is moving. For this purpose, an acousto-optic modulator (Bragg cell) is placed in the reference beam, which shifts the light frequency by 40 MHz (by comparison, the frequency of the laser light is 4.74 • 1014 Hz). This generates a modulation frequency of the fringe pattern of 40 MHz when the object is at rest. If the object then moves towards the interferometer, this modulation frequency is reduced, and if it moves away from the vibrometer, the detector receives a frequency higher than 40 MHz. This means that it is now possible not only to detect the amplitude of movement but also to clearly define the direction of movement. 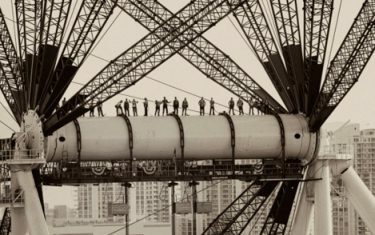 Rolling bearings are high-precision mechanical components and are mostly produced in very large quantities. As a world market leader in the bearing industry, SKF continually extends its lead in process development and quality technology. Dimensional tolerances are within a very small range of micrometres, and special attention is paid to low running noise of a bearing. In addition, SKF is dedicated to a Zero Defect policy in spite of producing millions of products every day. 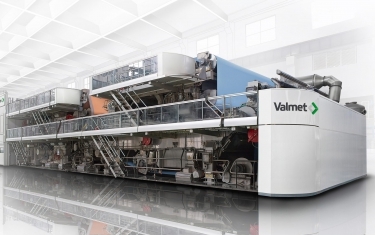 As a consequence, SKF applies ­­100 % noise testing at the end of the production line, and this requires highly complex and sophisticated testing systems (fig. 4). The MSL-7000 measures structure-borne noise of objects reliably and without contact. The acquired data provide valuable information to the SKF noise-testing electronics on manufacturing quality and compliance with a product’s acoustic emission limits. 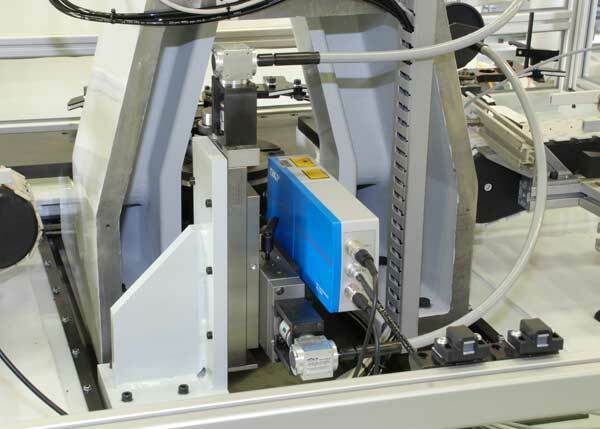 Direct integration of the SKF Laser Vibrometer into a production line provides a real-time quality control system, which enables automatic GOOD/BAD decisions. 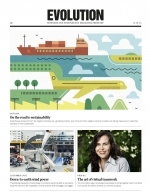 Thus, besides sustainable confirmation of product quality, the sensor substantially increases the cost-effectiveness of the production process. 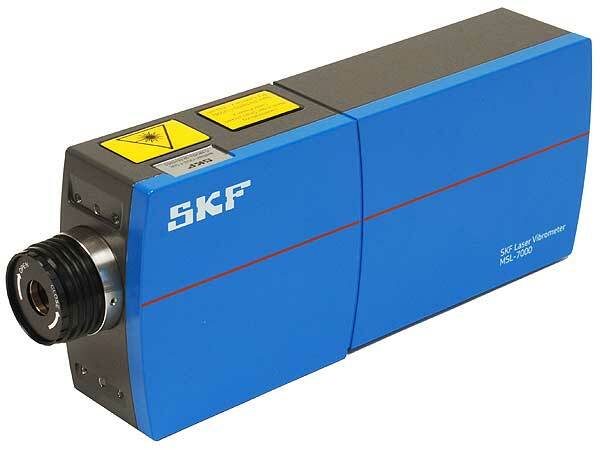 The SKF Laser Vibrometer is non-contact and wear-free and requires no servo mechanisms or noise protection for performing measurements. 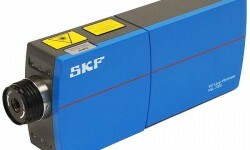 The use of the SKF Laser Vibrometer enables the simplification of equipment layout and design. 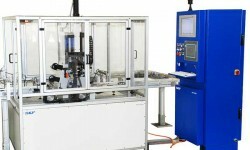 In addition, it is possible for machines such as life test rigs or run-in stations to be easily complemented with noise-testing sensors and electronics. 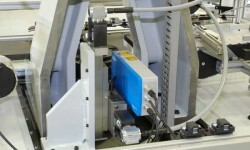 The sensor has become standard for all new noise-testing machines used in SKF factories (fig. 5). This new technology offers a number of advantages for SKF factories. The non-contact measurement of the sensor results in much extended life of the equipment and avoids unplanned stops. This is a flexible system that can be used in many different applications. It is an accurate technology that generates a constant signal and offers lower operating costs through quick resetting and simplified calibration. Additional benefits are that existing machinery is easy to upgrade, and any subsequent sensor repair can be carried out at moderate cost. SKF is now also capable of supporting its customers with quality control issues. The new SKF Laser Vibrometer can be connected with the SKF noise-testing technology for advanced end-of-line testing installations for electric motors, pumps, compressors and many more products. This means that SKF offers advanced quality technology competence to its customers as well, for final quality inspection and continuous manufacturing process improvements, following SKF’s vision: “To equip the world with SKF knowledge”.